Kim has a diverse and full background of life experiences that allow her to connect personally with each and every one of her clients. Her approach is at all times to put herself in a client’s position and answer the following question: “Knowing what I do about markets, strategies and risks, what would I do for your family to meet the identified objectives, if I was in your situation?” Her goal is to support clients for life. Kim began her professional career in Washington, D.C. working as a member of Congressman Les AuCoin’s legislative staff. She came back to Oregon to work for the Oregon Health Care Association and shortly after her driven success with the legislature, Kim left to help run Pizzicato, her family’s business, and take time off to raise her three children. In 2008, Kim joined the team at Rosenbaum Financial. Her personal approach to family and small business planning has helped Kim to a loyal and fast growing client base. As an experienced owner of a family business, and a widow, she empathizes with her clients’ real-world challenges and truly connects with each individual. As a seasoned advisor, she develops a plan and works side by side with the team at Rosenbaum Financial to bring in experience of all types of planning to provide her clients with total solutions to their needs. Kim is a Qualifying member of the elite Million Dollar Round Table, which is an exclusive forum for the world’s best life insurance and financial services professionals. She continues to maintain key relationships with professional business members in Portland working together so that she can provide the best overall client experience. 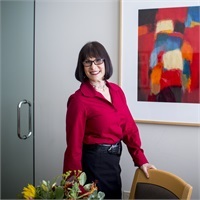 She has a strong commitment to the community and has previously served as Vice President of the Board of Directors of the Jewish Federation of Portland, development Chair of the Diabetes Advisory Council at the Harold Schnitzer Diabetes Institute at OHSU and Cedar Sinai Jewish Health Center board. When Kim is relaxing and spending some time for herself, she can be found working on writing her first book, “How to Talk to Your Parents about their Money”.